We've just finished a mini tour of Quebec performing a 10 minute stage version of the full show, powerful, puchy and very funny. Check out our latest news page... We're back from Europe, UK and Toronto... Not in that order! 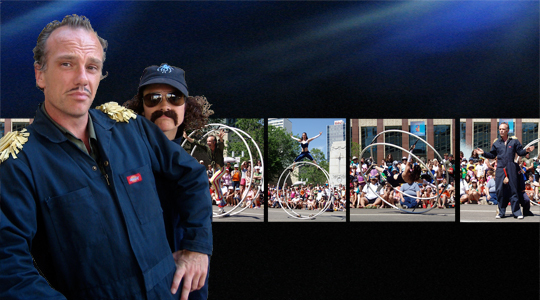 Shockingly funny and astoundingly skilful, Mat Velvet, star and wheel god, selflessly shares his talent with you. Monsieur Velvet sports a superb moustache, oozes charisma, and has a little tag along... for the sake of ease lets call him Charlie. Mat, smooth as Velvet, tolerates a small, eager, and annoying wannabe with a huge secret. This original blend offers an astounding display of acrobatic prowess wrapped in a hilarious crinkly wrapper with a stunning twist at the end. Dominique is one of the few female German Wheel artists in the world. Martin isn't. Dominique is beautiful and Martin... well you know. The site is continualy updated so please check back from time to time.